The fast casual restaurant business is fast-paced. In order to compete, restaurants face the challenge of further catering to their guests — their order, their way, on their time. Did you know that 95 percent of fast casual restaurant CEOs and CMOs reported that their improved online ordering systems met or exceeded their ROI expectations? With so many online ordering systems available, it can be difficult to determine the best way to implement a new feature like online ordering with your restaurant’s current website. That’s where Chepri® comes in. We specialize in creating attractive, efficient, mobile-responsive fast casual ordering systems that integrate seamlessly with your restaurant’s current website and POS system. … Not to mention the customer-level data that can be compiled through online ordering to improve your marketing metrics. … ALL IMPROVING YOUR FAST CASUAL ONLINE ORDERING ROI. What are your current online ordering pain points? Do you know how to alleviate them, all while growing your business? Let’s examine a paradigm success story, Piada. 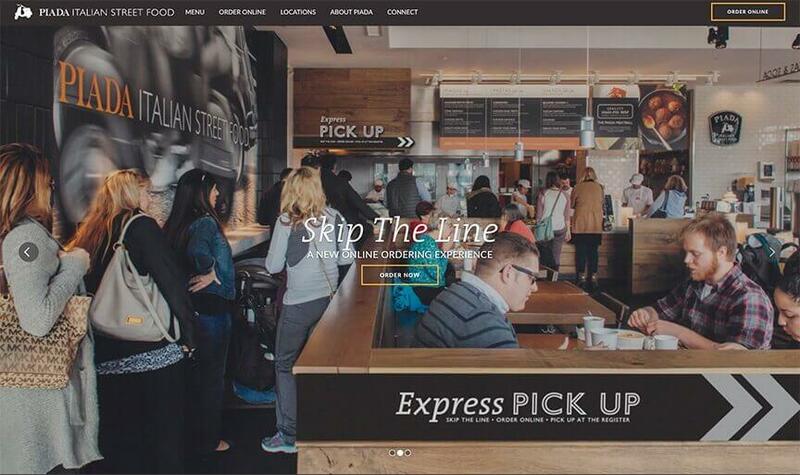 Chepri® was instrumental in the launch of Piada’s new fast casual online ordering system. Piada creates fresh, modern Italian food focused on high-quality, fresh ingredients and simple, complementary flavors. With plans to expand their market and scale their successes, Piada approached Chepri® to help them upgrade their website to further channel their brand and vision, as well as create a new custom online ordering system capable of handling their rapid growth. The system is integrated with Olo, an online ordering platform catering to multi-unit restaurants. The masterful design easily allows customers to add or subtract ingredients from Piada’s signature dishes, or select the create your own option and hand-pick your own unique, salad, pasta or Piada. The available toppings are displayed in a visual array, making it easy to see, select and unselect the desired ingredients. Putting in large group orders is a breeze with our online ordering system. You create the initial group order, and invite whomever you wish to include in the order. Each invitee will receive a link, and from said link will be able to add items to the group’s cart. Once everyone has placed their order, you can check out and pick up the order in the store. Easy as pie. Want a fast casual online ordering system like this? Piada’s initial quantifiable goal for their new fast casual online ordering system was five percent of total sales. With their old system, Piada was pulling 1.5 percent of total sales from their website. … Surpassing their goal by 240 percent with no additional in-store or online marketing for the service. Piada followed by introducing our fast casual online ordering system to 15 more locations in Ohio, as well as stores in Pennsylvania, Indiana, Michigan, Minnesota, and Texas. Subsequent to the initial launch of Piada’s first two stores using online ordering, in some locations, Piada has experienced upwards of a 10 percent increase in total sales revenue from online ordering without any additional advertising. All Piada stores have seen an increase in sales, averaging a 300 percent increase across their network, since Chepri® upgraded their online ordering system to the Olo fast casual platform.